Rep. Donna Oberlander was sworn in today for her fourth term, representing the 63rd District in Clarion, Armstrong and Forest counties. Pictured at left is Rep. Tina Pickett (R-Bradford/Sullivan/Susquehanna). Today’s ceremony marked the opening of the 199th General Assembly. 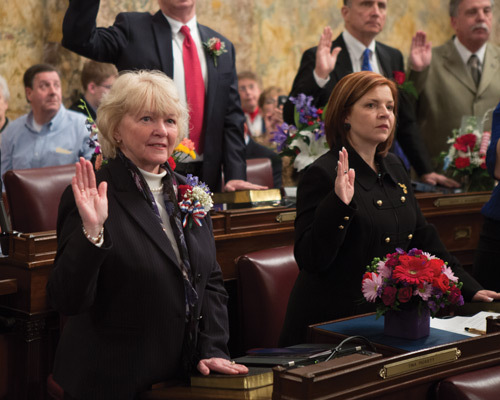 HARRISBURG – Embarking in a new role in the state House while keeping the issues of the 63rd District at the top of her to-do list this session, Rep. Donna Oberlander (R-Clarion/Armstrong/Forest) took the oath of office today for her fourth term in the Pennsylvania House of Representatives. She was joined at the Capitol ceremony by her family and loved ones. In November, Oberlander was selected by her peers to serve as caucus secretary, where she is responsible for recording all official action of the House and helping to mentor the first-term representatives. Being a part of the House Republican leadership team will allow her to have a seat at the table for negotiations on the state’s and region’s highest priorities. Before being elected to House leadership, Oberlander served on a number of high-profile committees in the House, including Environmental Resources and Energy, Appropriations, Local Government and Children and Youth. More information about Oberlander and her legislative priorities are online at www.RepOberlander.com and www.Facebook.com/RepOberlander.